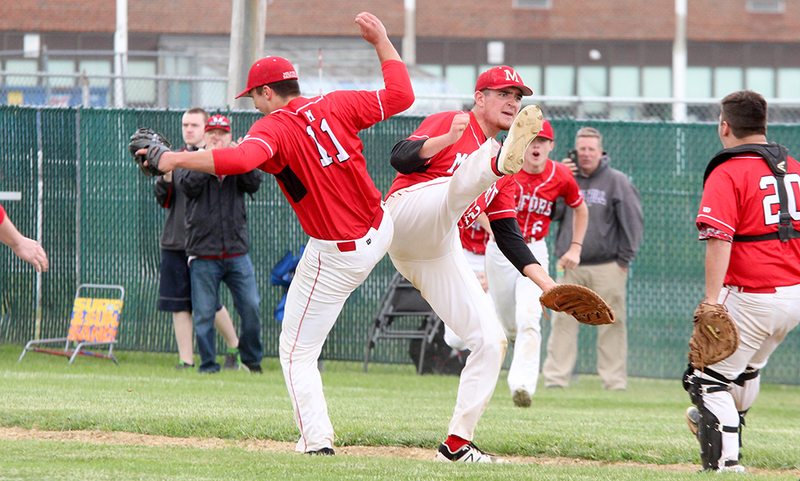 Milford, 12 @ Hopedale, 2 – Final – For the third straight game, Milford scored in the first inning and the Hawks rolled to a big win over non-league rival Hopedale. The Scarlet Hawks scored three runs in the top of the first, created more separation with six runs in the second and also scored in the third (one run) and fifth (two runs) innings. Junior Aidan Wilde (2-for-3) scored three runs and had three stolen bases, senior Ryan Goncalves (2-for-3) scored twice and had a pair of stolen bases and sophomore Alex Coady had a double and three RBI. Senior Alex Macek earned the win, allowing four hits while striking out eight in five scoreless innings of work. Milford, 5 vs. Grafton, 2 – Final – Milford senior Ali Atherton had a strong performance in the circle and senior Kaitlyn DeCapua stepped up offensively to lead the Scarlet Hawks to a win. Atherton tossed a complete game, scattering four hits while fanning six batters. DeCapua had a double and knocked in three runs while sophomore Emily Hartman had a solo home run.